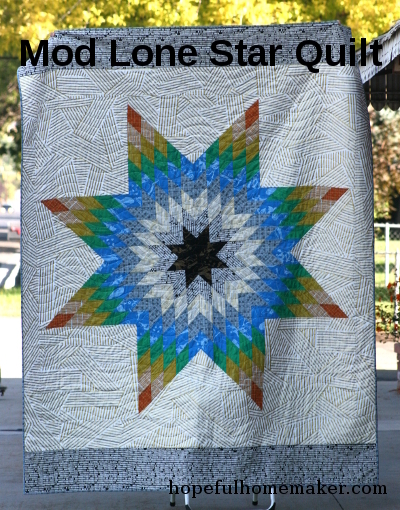 I am thrilled to introduce this Mod Lone Star quilt to you today! 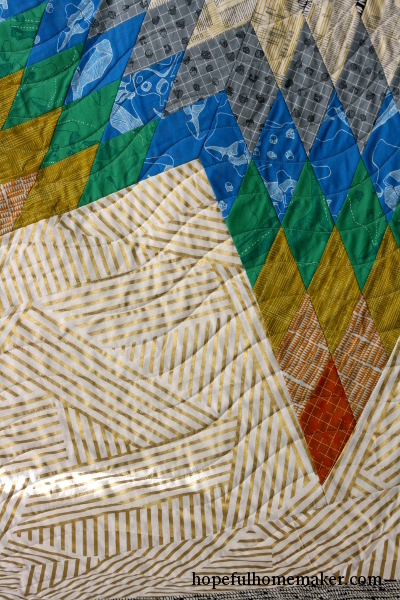 I have been making lone star quilt blocks for years now, and have learned a few things along the way. This Mod Lone Star is the first in a series of lone star quilt patterns that I will release over the next couple of months. 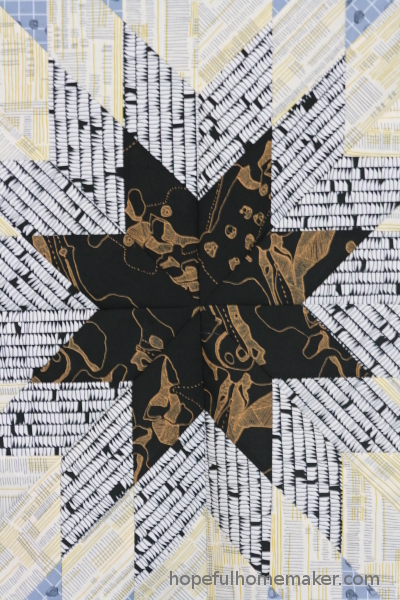 If you’d like to make a lone star quilt but don’t want to commit to a lot of blocks or too much time, then this quilt is for you. I use a strip piecing method for my lone stars, so there is no cutting or sewing of lots of little diamonds. 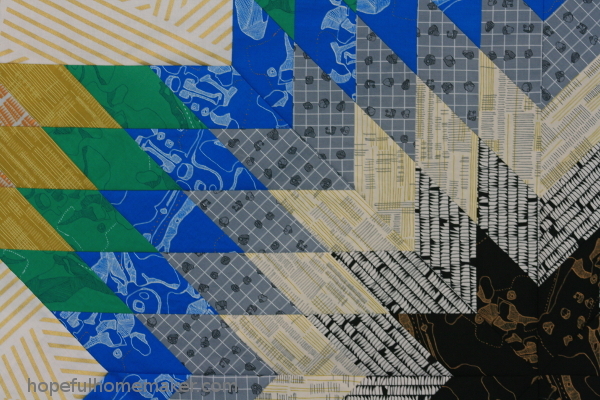 This project comes together quickly and because the scale of this pattern is larger, just one block can make the 70″ x 90″ quilt. 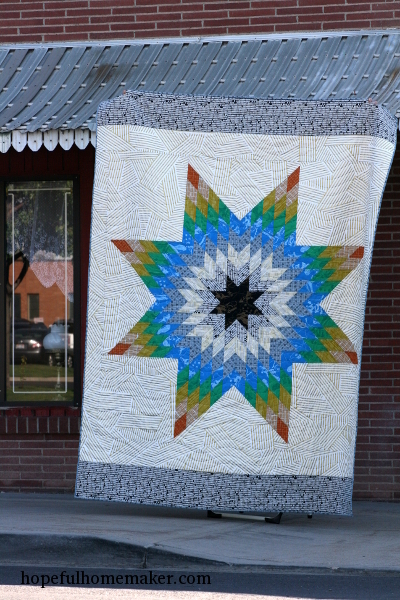 The lone star is a gorgeous traditional block that is very popular and a lot of fun to master. The lone star lends itself well to many different styles, and fabric placement creates countless options for designing a unique and stunning quilt, which is why we’ve included a coloring page for you to use in planning your quilt. For my quilt I used some favorite prints by Carolyn Friedlander, combined with the metallic gold manor stripe print from Victoria Findlay Wolfe’s Mostly Manor collection (which I am smitten with). I had so much fun planning and piecing this quilt. My lovely friend Melissa quilted it for me in a wavy edge to edge pattern that doesn’t compete with the background stripe and I’m thrilled with the end result. The Mod Lone Star Quilt pattern is available here in my Etsy shop. I’m so excited to see what you make with this lone star quilt pattern! Download it today! 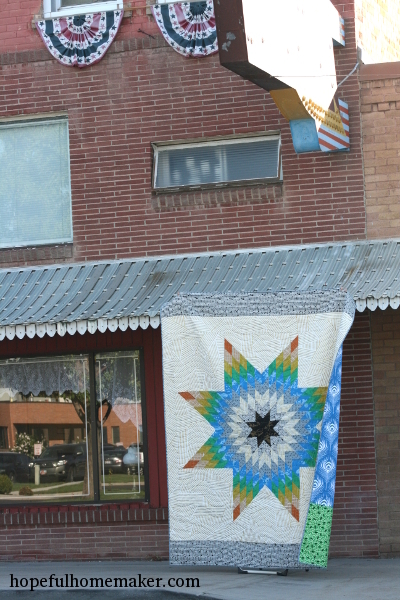 For more lone star information, including tutorials and other quilts, visit my Lone Star page.